and since I now have a laundry and clothesline again I was ready to start using cloth nappies full time. However instead of a 'ta-da' moment, I had a major d'oh moment when I realised I had completely stuffed them up. The logic behind modern cloth nappies is that the outer layer is waterproof, the inner layer is moisture wicking and the insert is absorbent. Well this doesn't work so well if you accidentally switch the fabrics around, in fact it doesn't work at all! So I guess I'll be spending the next little while unpicking, recutting and resewing, which is even more annoying because I got the new BWOF mag (well the 2/09 issue) in the mail and would rather be sewing from that instead. My husband (and his spotty four legged supervisor) was busy the last two weekends building a retaining wall. All it needs is some turf and landscaping and it will be done for now - next summer we'll get busy painting, building a deck and putting up a shade sail, but not right now because I don't want my handyman to get burnt out LOL! Oh and moo-i-made-it, if you're reading, our flowering gum tree there in background has finally flowered. After several years in the ground being well looked after it gave us nothin', and then six months of neglect and abuse by the builders it not only survived but came out with some beautiful orange flowers! So to reward it we built the retaining wall around it's root ball to let it keep growing and hopefully flower again soon. On to the comments to the last post - Mary Nanna I'm still cracking up at your puppies in a sack comment, I think we could all do with someone that honest in our lives. Vicki stop telling me the harsh truth, I wanna live in blissful denial! Jean, Kath and Kim the Australian version is a funny tv show about an aspirational Aussie family (thankfully it's all tongue and cheek and we Australians are not like that, well not all of us anyway). 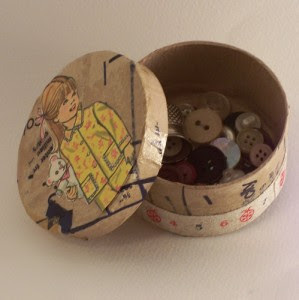 And I've been well and truly put back into my box regarding using pattern tissues for anything other than cutting out the patterns, I so didn't think of those patterns with pieces missing or ones that are falling apart and unable to be used. If I did have some of those, then I definately would use them for decorative pieces. Excitingly Anna slept through the night last night - she went down at 8pm and woke up at 6am which is just brilliant! She is actually a good sleeper at night, she usually only wakes up at 3am for a feed and then goes back to sleep really quickly, with her next feed at 6am and then we both sleep in until 9am (how luxurious!). However, she is a terrible day time sleeper, only napping twice a day for about 45mins at a time which doesn't leave me much time to get things done - this is when I spend all my time walking her around trying to get her to sleep so she doesn't get overtired and ratty by the evening. But I shouldn't complain because at least I'm not tired and worn out like some new mums whose babies still wake multiple times a night. As well as the millions of sewing blogs I love to read, I often stalk craft blogs, and Craftzine is a favourite. Then I see today that they link to a post with "projects you can make with the tissue paper of old sewing patterns". Whaddya mean, 'old' sewing patterns as if they have no value and need repurposing? Unless they are super fugly 1980s style patterns (which I strongly suspect may one day come back into fashion just like the previously daggy 60s and 70s patterns are), I think making the dress is much better than making paper flowers or reusing them for wrapping paper. Thanks for all your feedback on the BWOF pants from the last post. Mary Nanna you are so right about not adding extra volume at your widest part - I knew this, and have known this for a long time so why I thought now would be a good time to try something different is beyond me, especially since I'm still carrying about 7kg of excess post baby weight! So for now on, no more pleats for this little black duck. Oh and happy happy days, I can finally squeeze back into my pre-preggo jeans! They give me a massively unflattering muffin top a la Kim Craig (from the Aussie version of Kath and Kim not the poor US remake - no offence!) but I can do them up and a few more weeks of schlepping the little one around trying to get her to sleep may see that fixed too. I've decided I've done enough whinging about not doing any sewing for myself, and thought it was about time I did something about it. I like to have a whinge as much as the next person, but eventually you've gotta either do something about it or just shut up and accept it. So for the last three nights instead of laying on the lounge dangling my feet in husband's face in a not so subtle hint to get him to rub my feet (doesn't always work sadly!) I traced off a BWOF pattern and made me some new pants. Now I know a few posts ago I said I was crap at making pants that fit, but since the last pair turned out alright I'd thought I would make another since we are coming into the cooler months now. 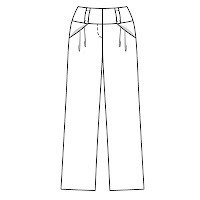 I used BWOF 11/08 pattern 121, which Burda describes as a "high waistband, low-set waist pleats and wide legs provide these trousers/pants with a slimming effect". Hmmm I think that slimming effect works best if you are already tall and slim like the BWOF model, because these aren't slimming on me at all. They are completely different to the style of pants I normally wear which are low waisted, flat front bootleg style, but I had nothing to lose except some fabric from the stash. I made these from a grey wool crepe like fabric (it's been in the stash too long for me to remember exactly what it is or where it's from....) which I thought would help those pleats drape fluidly. It's just that I think I'm too short and bottom heavy to wear light grey wide leg pants with pleats. Which is a pity because they fit really really well, the only change I made to the pattern was to include two small darts at the back to make the waistband fit more snugly otherwise the pattern is just perfect and was very easy to make. Althouh I did ignore the BWOF instructions completely because they usually make me too despondent and just made them in the usual order of pants making, and again I used the Sandra Betzina method for the fly zipper because it's practically fail proof. I might try these pants with different tops and shoes to see if I can find a better combo, or make these in a darker colour before I give up on this pattern completely. 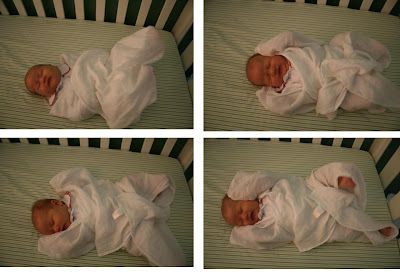 All the baby books I have read recommend wrapping babies snugly to help them settle and get a good sleep which is fine if your baby is not a kung fu master in training like Anna is! Seriously, she is like one of those magicians wiggling out of a straight jacket whenever I wrapped her, so I've given up. Instead I cut up one of the receiving blankets I bought from an op shop to make into a sleep sack because it was too small to be used for anything else. This was such an easy project too, all I did was fold it in half widthways, cut out arm and neck holes, sewed up the shoulder seam and added a zip down the front. I also reused the pink bias binding for decoration and then just sewed the bottom shut. It's probably a little too long judging by the photo below, but it will do the job and it allowed me to have a gloat to my husband when we were in a baby shop the other day and saw these for sale for $80!!! I made it from a cardigan I bought on impulse last year when I was heavily pregnant and it doesn't fit and nor do I like the colour and as a result never wore it. So now it has a much better life as an ugly looking monster that will hopefully bring a smile to a little boy's face. She doesn't sleep for long though, 30 -40 minutes at most but it's long enough to get something done and luckily I have my priorities right and put housework last on the to do list ha ha ha.